Today I was wondering what the heck to add to this blog. I need to keep it updated, fresh and interesting and sometimes it is difficult to feel constantly inspired. So, I had a peep through my photos from the past few weeks and found this lovely gem. I have known Hadleigh and Rachel for nearly 5 years and I think this photo is a small sample of a completely beautiful act. Simply, Rachel wanted to take a photo of Hadrian's Wall, so Hadleigh pulled back her hair so it wouldn't get in the way of the photo. All you girls out there, on the count of three... one... two... three ....Aaaahhhh *sigh* And the boys....*gagging sounds. In other news, totally and completely unrelated to the business, I started my Indian Head Message course. The first lesson was mostly informative. I learned the word Ayurveda which roughly translates into "way of life." Now, I am not really into Eastern religions and mysticisms or whatever and I have to say that I did roll my eyes a bit when the discussion went down this route. I know...I know...what do I expect from a course titled "Indian Head Message." Basically, I just want to give my husband a good head massage as he suffers from stress headaches. Plus, if I can do this for my friends, I figured I will be in line for some pretty nice Christmas pressies, or at the very least, arty and expensive Christmas cards. Sewing, planning, working on website, and general work on Gee How Quaint, teaching art at special needs school and primary school, resident's association committee (once a month unless there is work to be done), Indian Head Massage class, Archery, and the boring stuff like housework, cooking and doing the food shopping. I don't even have kids and to be honest, I can't imagine throwing that into the mix as well. I am contacting you because I am working with the authors of a book about blogs, and I'd like to request permission to use a photograph of yours in this book. Please contact me at matt@wefeelfine.org, and I'd be happy to give you more information about the project. Please paste a link to your blog in the subject field. Your assistance is greatly appreciated. 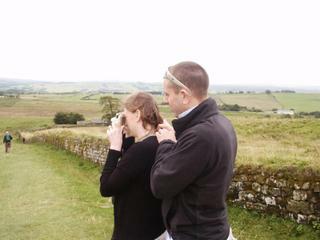 Simply, Rachel wanted to take a photo of Hadrian's Wall, so Hadleigh pulled back her hair so it wouldn't get in the way of the photo.